The Outside Lands music and art festival in San Francisco is very popular, so scammers are trying to pass off fake tickets as real ones. SAN FRANCISCO (KGO) -- Golden Gate Park was packed Friday night with music fans on the first night of the Outside Lands Music and Arts Festival, but a lot of people didn't get in because they got taken. This is the fourth year in a row that it has sold out. In fact, this year it sold out in 24 hours. Police are confiscating a huge number of counterfeit tickets sold by scammers to unsuspecting concert goers. Even before the music started at the Outside Lands Music and Art Festival, police had their hands full. There were numerous medical calls for alcohol and drugs. A lot of booze got confiscated at the main gate, but minutes after we arrived, concert fans approached us with the same story -- they got scammed with fake tickets. San Francisco resident George Kontridze said, "I got denied entrance, so it's nobody's mistake but my own. Kontridze bought two tickets for $500 on Craigslist and so did San Francisco resident Alex Tejada and her brother, George Tejada. "I tried to get in, but got denied... void," said Alex. "It had the right printing, it has the blue tints when you hold it up, so it passed all the tests, but just not the barcode test," said George. San Francisco police confiscated stacks and stacks of fake tickets on Friday alone. Many of them were sold by scalpers, who did not want their picture taken when we go too close. One man even tried to shove our camera and another man, suspected of selling bogus tickets, was patted down and questioned by officers. San Francisco Police Sgt. Dean Marcic confiscated a number of tickets in less than an hour from scalpers. He said, "They look very real, but the issue is they're very fake. It's unfortunate that we live in a world nowadays where it's buyer beware. A lot of times when something's too good to be true, it's too good to be true." Police say use caution when buying tickets online or else it could leave you enjoying the music from outside the gates. There are some really big acts this year along with some really devoted fans. Now in its seventh year, Outside Lands has quickly become a tradition. "I've been to every single one. Every single one, my wife here's been to the last three," Bob Campbell said. 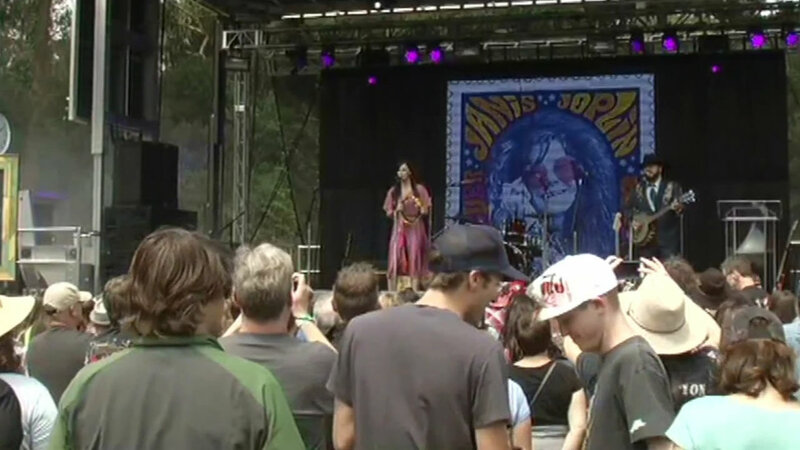 Music fans from across the U.S. gathered at San Francisco's Golden Gate Park for the Outside Lands Music and Arts Festival on Friday. Though many of the artists are known all over the world, the festival itself is undeniably San Francisco. For instance, just take a look at the food. "We really set the bar for having restaurants and food that wasn't just your average food," Another Planet Entertainment Gregg Perloff said. Attendee: "The best damn cheeseburger." Due to a ban on bottled water in the city, a filling station was made available. This eliminates a common problem found at other festivals. "When you buy just one bottle, it's like a Dasani water bottle and it's like $8, it's a lot nicer to have free water available to you all the time," Janelle Gleason said. And of course, there's the weather. "It's all about the layers. Jackets on jackets off, make up your mind, Adrienne Campbell said. "And look, the sun just came out, you know you don't know from minute to minute what's gonna happen," Bob said. But never mind the fog, when the stage lights come on, it's all about the music. Kanye West is Friday night's headliner and Saturday night will end with Tom Petty and the Heartbreakers. The festival closes out with the Killers on Sunday night. Over 100 bands playing this weekend. To get the full lineup, click here. Again this year, there will be a Community Hotline to respond to any issues that may affect you during the festival. The festival hotline will be available from 10:00 a.m. - 11:00 p.m. on the festival days. The hotline number is 415-390-2737.